Striker Lloyd Dawes is set to leave Worthing Football Club and join National South Eastbourne Borough. Worthing have reluctantly accepted a bid for Dawes, who has scored 80 goals in 163 appearances for the club. 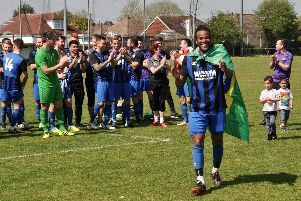 The frontman signalled his intention to leave last week but was offered a new deal by Worthing at the weekend, however he reportedly re-iterated his desire to quit by handing in a transfer request. Eastbourne have submitted a bid and the transfer is now only subject to Dawes agreeing personal terms with Borough. The fans' favourite is set to follow Kane Wills to Priory Lane, after Worthing's captain made the move earlier this season and he will also link up again with former Worthing joint boss Jon Meeney, who is now a coach at Eastbourne. Worthing managing director Calvin Buckland said: “We didn’t want Lloyd to leave, we made that clear to him. “We all believe he’s capable of playing higher than National League South and felt if he continued to do well here he’d get the move he deserved, however he was adamant he wanted to go now”.